On behalf of the organizers, we would like to warmly invite you to attend 2nd International RILEM/COST Conference on Early Age Cracking and Serviceability in Cement-based Materials and Structures EAC-02 to be held in Brussels, Belgium during 12–14 September 2017. This International RILEM Conference follows the RILEM International Conference on Early Age Cracking in Cementitious Systems (EAC’01) organized in March, 2001, in Haifa, Israel, by Prof. Konstantin Kovler. The EAC’01 conference was dedicated to early age cracking in cementitious systems, one of the most prominent topics tackled by COST Action TU1404. Indeed, this Action includes a working group 1 related to the testing of cement based materials and RRT+ (with group priorities on fresh properties and setting, chemical and microstructural characterization, transport properties and boundary effects, mechanical properties and creep, volume stability and fracture properties and cracking), a working group 2 related to modeling and benchmarking (with group priorities on microstructural modelling, multiscale modelling, macroscopic modelling, probabilistic modelling and benchmarking calculations) and a working group 3 related to recommendations and standards. 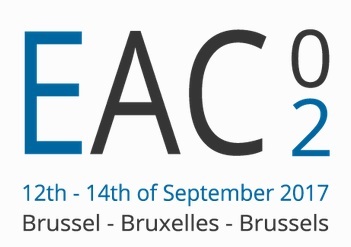 It is the reason why, to continue the tradition of the specific conference EAC’01, the idea came naturally to organize ‘EAC-02’ in conjonction with the annual event of the COST Action TU1404. We hope you are encouraged and look forward to hosting you at EAC-02.